This year, CPNYC's Young Professionals Council has partnered with Generosity Series in a multi-charity 5K run/walk taking place on Sunday, May 19th, 2019 at 7:30am in Brooklyn’s beautiful Prospect Park. A brunch and meet-and-greet with fellow runners, CPNYC supporters, and staff will follow the 5K race. We invite all participants to join us for post-race refreshments and conversation. Donors, volunteers, and passionate supporters will gather together and fundraise in support of CPNYC. You can find a map of the race course here. Interested in learning more about CPNYC? Visit our website here. Help us fulfill CPNYC's mission of breaking the cycle of intergenerational incarceration by joining us in this year's 5K! Interested in becoming more involved in CPNYC? Check out our volunteer opportunities below! CPNYC's after-school program and Saturday Resource Center (SRC) provide volunteers with an opportunity to visit CPNYC and engage with CPNYC's staff and young people. Through the after school program, volunteers can support the program by tutoring elementary and middle school-aged students in a number of subject areas, including Math, Reading, and Science. The Saturday Resource Center (SRC) offers individuals and groups a chance to assist CPNYC youth with homework assignments and engage in interactive games. To learn more about these opportunities, visit our website here. If you or your business is looking to become more involved in the organization, corporate social responsibility is paramount to CPNYC's volunteerism. Starbucks, The Brooklyn Nets, and MSCI are among the many philanthropic organizations that have supported CPNYC in the past. We invite businesses to support CPNYC through sponsorship, in-kind donations, and other forms of philanthropic support. To learn more, visit our website here. CPNYC's mentors are the bedrock of the organization's volunteer base. Our mentors are role models for our youth. Potential mentors complete a thorough interview process before they are paired with a mentee. Every mentor commits 1 year and at least 4 hours per month to their mentee. To learn about a few of our current mentors and their mentees, visit our website here. Eager volunteers can seek membership for one of three committees: the Young Professionals Council (YPC), Women's Philanthropy Group (WPG), and CPNYC's Executive Board/ Board of Directors. Each committee is responsible for planning an array of fundraising and social events to raise funds for the organization, advocate for CPNYC's mission, and recruit new committee members and potential donors. To learn more about CPNYC's committees, visit our website here. 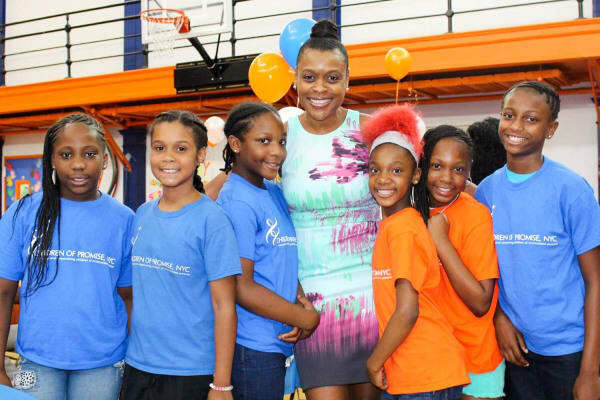 Founder and President Sharon Content (center) celebrates the kick-off of CPNYC's summer camp program with a few CPNYC campers. Facebook: Visit our website here.